By some simple math, Super Tuesday 3 or as they call it "Mega Tuesday," will be a crucial day for both Democrat and Republican candidates as they battle it out in five key states: Ohio, Florida, North Carolina, Illinois and Missouri. At this early, Senator Marco Rubio has announced that he is leaving the GOP race after losing in his home state of Florida, while Ohio Governor John Kasich has won his home state's primary, handing frontrunner Donald Trump a huge loss. So what more could happen after March 15? 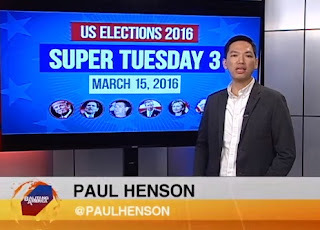 Watch the explainer video below by ABS-CBN's North America Bureau Chief Paul Henson.